Cacao liquor is the basic ingredient in chocolate. Contains no dairy, soya or sugar. This product is simply 100% cacao solids in drop form. 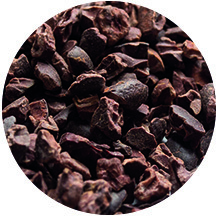 Cacao liquor is produced from cocoa beans that have been fermented, dried, roasted,and separated from their husks. Cacao has more antioxidant flavonoids than other foods and drinks, including blueberries, red wine, black and green teas. Cacao is rich in a number of essential minerals, including magnesium, Sulphur, calcium, iron, zinc, copper, potassium and magnesium. Use cacao liquor in any recipe that calls for unsweetened baker’s chocolate. Melt cacao liquor to make hot chocolate and fudge yoghurt, chocolate ice-cream. Use it also for desserts. Perfect to make home made chocolate.